A few years ago we had an invasion of caterpillars that was so bad we would be driving over a carpet of them to get into our garage. Seriously, our blacktop was a moving wave of caterpillars. It freaks me out to this day, but hey-at least they didn't fly. Just think about how hard it is to avoid flies! 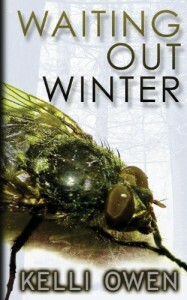 WAITING OUT WINTER is about an invasion of killer flies; a government experiment gone wrong, (don't they always?) However this isn't your average romping, chomping creature feature. This is a quiet little horror story, taking place during an apocalypse, but focused on the disaster from a small town and family point of view. It's not gory, but it is poignant, sad and scary. This was a short, entertaining story and only my second from Kelli Owen. I recommend it and I will be on to the second novella shortly!